This weekend should be a treat for NCAA Division I Cross Country fans. With the 2017 NCAA Division I Cross Country Championships less than two months away, top-ranked teams are beginning to unveil their best lineups. 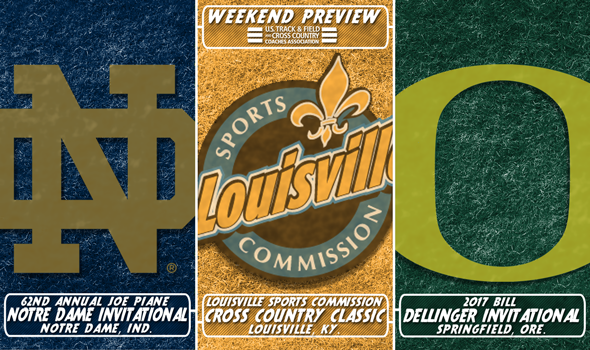 We’ll preview three meets in which we expect there to be fireworks: Oregon’s Bill Dellinger Invitational, Notre Dame’s Joe Piane Invitational and the Louisville Sports Commission Cross Country Classic formerly known as the Greater Louisville Classic. When both teams from Oregon and Stanford are in the same meet, you pay attention. This will be the season debuts for both the Ducks and Cardinal on Friday as the former had to cancel a home meet earlier this season due to concerns about air quality, while the latter doesn’t truly start to race until late September/early October. The Men of Oregon appear to have just about everybody set to race outside of 2016 XC All-American Matthew Maton. Look for Tanner Anderson, Blake Haney, Travis Neuman and Sam Prakel to hold down the fort for the Ducks. Stanford won’t race 2017 NCAA Outdoor 5,000-meter champ Grant Fisher or Thomas Ratcliffe, but are expected to enter Steven Fahy, Alex Ostberg and Alek Parsons. Don’t forget about BYU, though. The Cougars made it look easy at the BYU Autumn Classic this past weekend and handed 2015 NCAA champ Syracuse a loss at the season-opening Panorama Farms Invitational last year. 2016 XC All-American Rory Linkletter, Connor McMillan, Clayton Young and Casey Clinger combine to make a formidable lineup. The Women of Oregon won the NCAA title in dramatic fashion last year and are out to prove they can repeat. This year the Ducks will be led by Katie Rainsberger and we’ll see the debuts of transfers Carmela Cardama Baez (Florida State), Susan Ejore (Monroe College) and Judy Pendergast (Harvard) in Oregon uniforms. Stanford is expected to race Ella Donaghu, Vanessa Fraser and Fiona O’Keefe, among others. That trio helped the Cardinal place fifth at NCAAs last year. O’Keefe was one of five freshmen to earn All-America honors in Terre Haute, Indiana. Washington is without Charlotte Prouse in 2017 as she transferred to New Mexico, but Amy-Eloise Neale has the team in good hands. Neale had a breakout season last year on the grass and finished eighth at NCAAs. Other ranked teams in the meet include the 17th-ranked Portland men and the 19th-ranked BYU women. It’s not often that Colorado truly opens its season outside of the Centennial State. The last time it happened was 2008 when the Buffs went to the Iowa State Classic. So when Mark Wetmore takes his charges to Indiana, you know it’s a big deal. Colorado will split both squads as its varsity will compete at the Joe Piane Invitational on Friday and its reserve varsity will hang back in Boulder for the Rocky Mountain Shootout the following day. We’re paying close attention to the women’s race as the Buffs take on third-ranked New Mexico, seventh-ranked NC State and ninth-ranked Arkansas, among others. That’s four teams ranked in the top-7 of the most recent National Coaches’ Poll. It reminds us of last year at this meet when then-No. 1 Providence went up against No. 2 New Mexico and No. 5 NC State. The Friars cruised to the team title as the Wolfpack finished runner-up and the Lady Lobos fell all the way to fourth. It should be an incredible race for the individual title as there are eight All Americans from NCAAs last year in action: Arkansas’ Taylor Werner (16th), New Mexico’s Alice Wright (19th), Colorado’s Dani Jones (22nd), Eastern Michigan’s Jordan McDermitt (24th), NC State’s Rachel Koon (25th), Colorado’s Kaitlyn Benner (26th), Colorado’s Mackenzie Caldwell and Colorado’s Sage Hurta (40th). Over in the men’s race, fourth-ranked Colorado will face No. 11 Washington State and No. 13 Southern Utah, among others. The Buffs will see both of those teams again as the Cougars are in the Pac-12 and the Thunderbirds compete in the Mountain Region. Could we see a reprise of last year when an unheralded team like Ole Miss steals the team title? It seems far-fetched with how strong Colorado is expected to be, but anything can happen on any given Saturday and both Southern Utah and Washington State have battle-tested rosters. Just like their counterparts, the men’s individual race is going to be epic as well. You’ll have athletes from all of those aforementioned teams alongside Alabama’s talented trio of Alfred Chelanga, Gilbert Kigen and Vincent Kiprop. Consider this the Pre-National to the Pre-National. Teams that most likely will not be competing at the Pre-National Invitational on October 14 at E.P. “Tom” Sawyer Park are likely to test their might – and the course – on Saturday at the LSC Cross Country Classic. Defending national champion Northern Arizona is No. 1 in the most recent Men’s National Coaches’ Poll and debuts its lineup here. 2016 NCAA XC All Americans Tyler Day (23rd) and Andy Trouard (37th) will compete for the Lumberjacks and blue-chip recruit Luis Grijalva will make his collegiate debut. It won’t be easy for NAU as No. 7 Wisconsin and No. 12 Furman headline the rest of the ranked teams. The Badgers and Paladins return a ton of veterans led by Morgan McDonald (who might be held out due to a long track season) and Troy Reeder, respectively. The women’s field doesn’t have as much top-end talent as the men’s, but should still be a good battle. No. 18 Wisconsin, No. 20 Minnesota and No. 25 Vanderbilt are all entered. Oklahoma State hosts the Cowboy Jamboree, which features both of the home teams as well as those from Ole Miss and Penn State, among others. Missouri is entered in the women’s race, which means we could see defending NCAA XC individual champ Karissa Schweizer in action. The Tigers also have 2016 XC All-American Jamie Kempfer on their roster, while the Nittany Lions have a pair of All Americans themselves in Elizabeth Chikotas (not running) and Jillian Hunsberger. Lehigh hosts the Paul Short Run and it will be stacked, like usual, across the board with 27 combined ranked teams from NCAA Division I, NCAA Division II and NCAA Division III entered. Speaking of those teams from NCAA Division II and NCAA Division III, fans will see both programs from Adams State (NCAA DII No. 1 men featuring Sydney Gidabuday; NCAA DII No. 2 women), the men from Mount Olive (No. 5 NCAA DII) as well as five men’s teams ranked in the top-15 of the most recent NCAA DIII poll and five NCAA DIII women’s teams listed in the top-25.